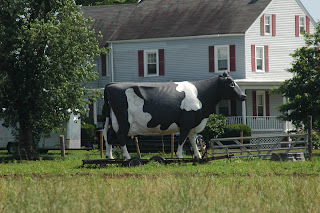 Hidden New Jersey: Behold the Trojan Cow! In my report about the Negri-Nepote Grasslands a few weeks ago, I mentioned that we'd driven past the farm holding the Trojan Cow, a large Holstein-looking cow statue that stands in front of a farmhouse on South Middlebush Road in Franklin Township. We drove past again today, and as luck would have it, we found a side road that hadn't shown itself in the past, allowing me to pull over to get a picture. Look closely, and you'll see that the cow is standing on a trailer. All the more to transport it to its intended destination with the invading force inside, I suppose. Rather than standing next to the Trojan Cow as they did the last time we passed by, the live Holsteins were across the road, clustered around a 300kV transmission tower. We could hear the lines crackling overhead. You have to wonder: do they get some sort of milk production boost from all that voltage? Or do they just like the tower for another reason? I guess we'll never know. Incidentally, you might wonder why I didn't stop by and ask the farmer about the Trojan Cow. There were enough No Trespassing signs around the farm to dissuade me from stepping foot on the property. I suppose they'd probably dealt with their share of pranksters and curiosity seekers, and I didn't want to add to the hassle.